Replaced by the 1073 – PhidgetSBC3. 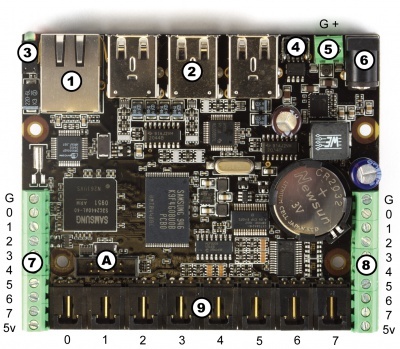 The PhidgetSBC2 is a Single Board Computer with an integrated PhidgetInterfaceKit 8/8/8. At its most basic, it can be thought of as a Phidget that you connect using a network cable instead of USB. 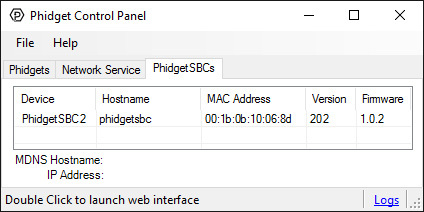 The PhidgetSBC2 also provides six full-speed ports that allow you to use normal USB Phidgets over its network connection. This can extend the effective range of a Phidget from USB’s maximum of 15 feet, to anywhere that your network reaches. The PhidgetSBC2 exposes an easy to use interface for setting up and running custom applications on-board. 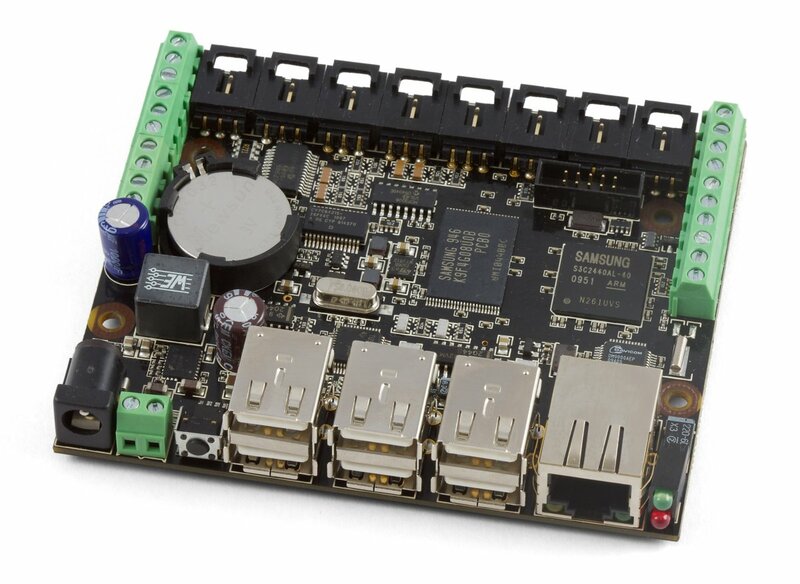 This allows the PhidgetSBC2 to operate autonomously, without the need for a graphical interface or a remote connection at all times. For more advanced users, the PhidgetSBC is an embedded computer that runs Debian GNU/Linux. We provide full shell access via a built-in SSH server, access to the full Debian package repository, and all of the standard command line tools expected on a modern Linux system. An integrated PhidgetInterfaceKit 8/8/8 allows you to connect devices to any of 8 analog inputs, 8 digital inputs and 8 digital outputs. It provides a generic, convenient way to interface your PC and PhidgetSBC with a wide variety of devices and it operates exactly the same way as an external PhidgetInterfaceKit. When controlling the PhidgetSBC remotely, you can use any Phidgets supported operating systems and languages and you can look at the following code samples that are demonstrating the SBC's PhidgetInterfaceKit functionality. Support for C, C++, Java, .NET(Mono), or Python can be added from the Debian package repository, as outlined in the product manual. The labeling on the underside of the board for the Power Input Terminal is reversed. The correct polarity is as shown below. You can protect your board by purchasing the 3817 - Acrylic Enclosure for the SBC. February 2014 Product Discontinued. Succeeded by the 1073 - PhidgetSBC3.